Only one person enters the trades for every four people leaving today, so construction companies need to hire people for these good-paying careers. 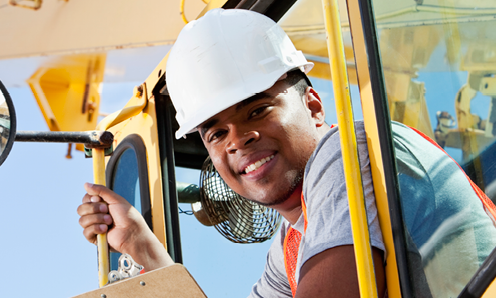 Construction laborers start at $35,000 a year and quickly earn more with additional training and experience. If you’re looking for a career with real potential, contact us to find out when our next TrANS info session is. We offer classes in Dane, Rock, and Brown counties. If you live in a nearby county and have reliable transportation, please apply. Before enrolling in the Southwest TrANS program, Jeovonte said he "felt caught between a rock and a hard place” when it came to work. He wanted a career but didn’t know how to make the changes to earn a steady income for his family. When he heard about TrANS, he knew it was the opportunity he’d been searching for. Working second shift throughout the class, Jeovonte put it all down every day in TrANS. His hard work paid off when he was offered a position with Rock Road Companies after graduation. Using the lessons from TrANS every day (arriving 30 minutes early and staying 30 minutes late), he has quickly established himself. He was recently invited to an apprenticeship meeting with the Operating Engineers this month. Congratulations and good luck Jeovonte.